This Topaz Portable Air Conditioner is quiet, powerful and durable for use in office and industrial settings. Digital programmable thermostat provides complete comfort control. 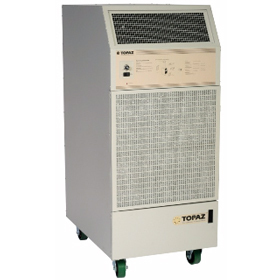 TOPAZ TZ60A Portable Air Conditioners are designed to spot cool industrial, commercial, institutional, and construction sites and can be used in offices, schools and server rooms. This unit delivers full performance at a wide range of temperatures and altitudes. Topaz Portable Air Conditioners are completely self-contained and housed within an insulated cabinet. They are designed for ease of operation and rugged dependability. All models are equipped with standard heavy-duty casters for portability and have removable side panels for easier servicing from all sides. Options include discharge nozzles to direct conditioned air precisely where needed, and flexible duct to transfer condenser hot air either outside or to an adjacent area.